To experience this divine connection is the accurate practice of RajYoga Meditation. Meditation is a conscious choice to create quality thoughts. A tranquil mind does not erupt or react to things, rather it has the capacity to observe. 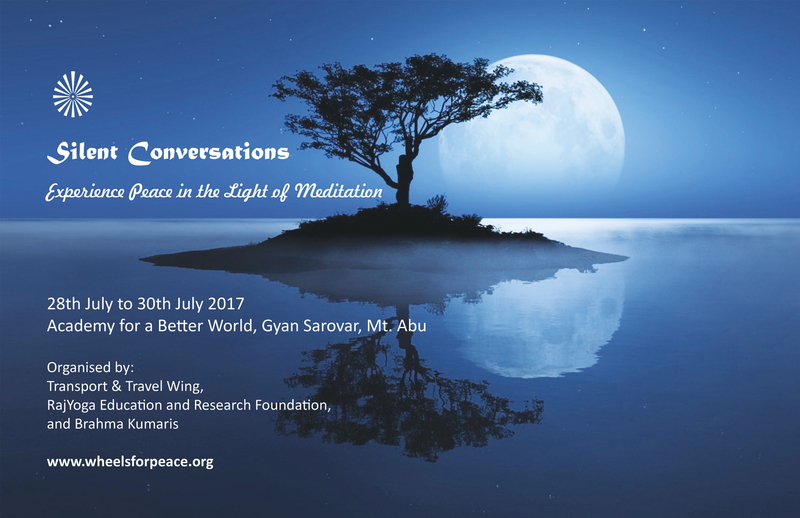 Silent Conversations is a special retreat to enable one to Experience Peace in the Light of Meditation. We cordially welcome you to this retreat to relax, refresh, and recharge. This retreat is open to those experienced professionals from Transport, Travel and Tourism Sectors who wish to Experience Peace, Explore Silence, Embrace Happiness and Enrich Life. Kindly carry a copy of the SMS confirmation when you reach the venue. Note: It is mandatory to provide correct email id and mobile number for registration. Gyan Sarovar, Academy for a Better World, spread across 28 acres of land, offers residential programs on practical implementation of human, moral and spiritual values and principles. Universal Harmony Hall, Spiritual Art Gallery, International Center for Higher Learning, Meditation Rooms, three man-made lakes and solar energy plant. In 1996, the Academy was presented to Habitat II, the second UN Conference on Human Settlements held in Istanbul, Turkey. It was recognized as part of the Best Practice Initiative for Human Settlements. This retreat is being organised by the Transport & Travel Wing of RajYoga Education and Research Foundation. R.E.R.F. is a sister organisation of Prajapita Brahma Kumaris Ishwariya Vishwa Vidyalaya.